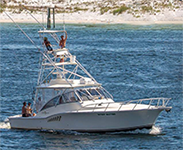 Destin is home to Florida's largest and best equipped fleet of deep sea fishing charter boats. 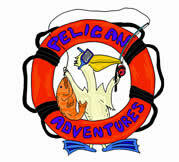 They include fishing charters and less expensive fishing party boats that charge a flat rate per person. Most fishing charters are half day or full day but longer charters can be arranged. Bottom fishing, trolling and big game fishing are all available. Also specialty fishing for sharks or other specific types of fish. Some smaller boats specialize in protected bay & inland waters. Typical fish species caught include red snapper, grouper, dolphin, shark & trigger fish but many others exist in our waters. Three of Destin's top producing deep sea fishing boats offering all day or overnight fishing charters. All boats are fast, clean, comfortable, air-conditioned, and have interior bunks, dining area, and a restroom. We supply the crew, bait, ice, tackle, and fishing licenses. Charter Boat Phoenix caters to all levels and types of fishing! Captain Scott Robson has thirty years experience in Destin and is ready to help with your fishing adventure. USCG approved for 22 passengers, A/C, Microwave, refrigerator, TV, DVD, bathroom, 8 sleeping bunks. Big live well for fishing (with live bait). Call 850.837.9734 to plan your fishing trip abroad the Phoenix today! 1.4 million in cobia & marlin tournaments. We do all types of trips and fishing but long range two and three day tuna trips are our specialty! Charter boat AL-LE operated by Miss Sandy Charters & Captain Paul Cox. A 45 foot Custom Bertram offering private charters for up to 6 passengers. Outstanding interior accoutrements and comfort, full galley, full size restroom & shower, sleeps 6, 37" flat screen TV, all modern electronics, outriggers and tuna/cobia tower, three AC units for ultimate comfort. We have the finest Custom tackle in the fleet. Trips are available from 4 to 48 hours. Shark trips available nightly. Living and fishing in Destin for the last 20 years, we aim to give you the best fishing experience! Let us set you up on a fishing charter this season with the best crew in town!